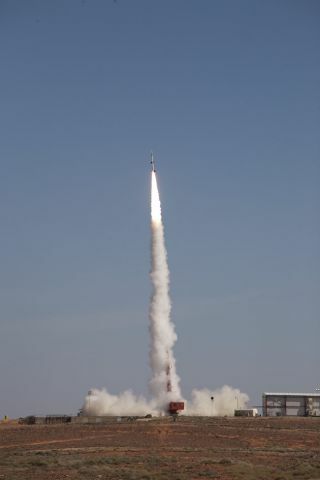 A hypersonic rocket launches skyward during a March 22, 2010 test launch from the Woomera Test Range in Australia. The fight is part of the joint U.S.-Australian HiRise project to test and develop hypersonic vehicles for future aircraft transportation. Australian and United Statesmilitary scientists test launched a new hypersonic rocket this week, the latestin a string of demonstration flights aimed at developing ultra-fast supersonicaircraft. The test rocket streaked through the atmosphere at speeds ofgreater than Mach 5.5, which is equivalent to more than five times the speed ofsound. The flight marked the second in a series of up to 10 plannedflights designed to advance research on high-speedflights and hypersonic technology, said Greg Combet, Australia?s Ministerfor Defense Personnel, Material and Science, in a Monday statement. An earliertest was performed last May. ?Today?s flight represents a significant scientificmilestone, enabling scientists to collect fundamental data critical to thedesign and development of an engine capable of sustained hypersonic flight,?Combet said. The flight, which launched from Australia?s Woomera TestRange, was part of a joint U.S-Australian program called HypersonicInternational Flight Research Experimentation (HiFiRE). The program is aimed atinvestigating the fundamental science of hypersonictechnology, as well as the potential future applications for next generationflight systems. The research is being conducted as part of a partnershipbetween the Defense Science and Technology Organization (DSTO) and the U.S. AirForce Research Laboratory (AFRL). In 2006, AFRL officials signed a $54 million deal with Australia?sDefense Department to fund the six-year HiFire program. The project alsoincludes participation from NASA scientists, as well as U.S. industry and otherAustralianhypersonic scientists, AFRL officials have said. The scientists are investigating the potential of airvehicle and propulsion technologies that could one day lead to sustainedhypersonic flight. Advances in hypersonic technology have enormous implicationsfor both Australia and the world. Hypersonic flight has the potential torevolutionize global air travel, and could present more cost-effective ways ofaccessing and launching communication satellites in space, researchers said. ?Thanks to the work of this dedicated team of DSTOscientists, Australia is at the forefront of this technology,? Combet said.